This summer, I bought a Flevobike Greenmachine recumbent bike. Marvelous piece of technology. First long distance ride: 450 km to CCC, mostly in former East Germany. Still, an enjoyable experience, and faster than you think. Leuven-Brussels, door to door, less than an hour for a geek without any real training. How many miles is that? I cycle to work here in Portsmouth, UK, and it takes me about 47 minutes on the way in, and 53 home again. That is just over 11 miles. I have been doing that three times a week all summer, and I have not yet got any faster. I am wondering if I will be any faster on a bike like yours. Distance between my place in Leuven and Grote Markt/Grand Place in Brussels is about 26.9 km (16.77 medieval units :-p). You can expect to ride some 5km (3.1 miles) per hour faster on a decent recumbent, with the same or less energy spent. This should increase with practice, because one uses different muscles on a recumbent. You get the maximum benefit when you can use long, flat or slightly descending roads. 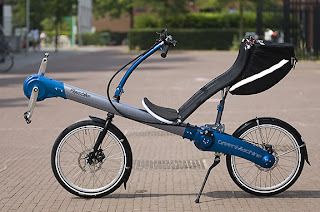 Be aware that many recumbents do require somewhat more maintenance, the flevobike greenmachine being an exception that actually requires much less maintenance. Indeed very nice bike but a little bit too expensive for my budget. Do you really have to talk about a "GDR" in 2007? I find that most recumbent bikes are too low to the ground for use in traffic. I do like the comfort and speed. The RANDS company has made "Crank Forward" bikes that are good for commuting. What an interesting bike! Does your neck ever ache for having to look up from that position? Can you see well? I like that bike,interesting bike.It has speed and mobility,it seems it has a motor on it?Same as my Vespa Scooter i bought long time ago,through their web vespa verhuur I need it everytime i worked. Excellent Blog!